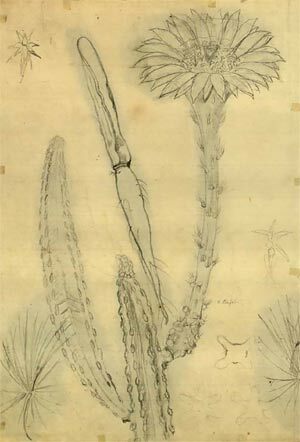 Sketch of Cereus greggii by Paulus Roetter. With so much information available on the Internet, it’s impossible to know what you’re missing. The Florilegium’s website and our contributions to The Desert Breeze rely on several large-scale digitization projects that provide open access to an overwhelming number of artworks and publications that are in the public domain. Here are two of our favorite sites that you may have missed. BOTANICUS. This is one of the web’s early digitization projects from the Peter H. Raven Library at the Missouri Botanical Garden (MBG). It began as a project to make available online the gems of the Library’s rare books collection and has now expanded to include many important early works in botanical systematics. To date, the project has scanned some 2.5 million pages from the Library’s collection. Artists, historians, botanists, and gardeners can fill hours browsing the collection. When visiting Botanicus, you can browse the site by year of publication, author, title, or subject (the search function is fussy and not always helpful). Single pages or entire volumes can be downloaded as PDFs. Artists can access the entire Besler Florilegium from 1613 (also known as Hortus Eystettensis ) or the lush paintings from the 1807 Temple of Flora . Botanists can find the complete volumes of Curtis’s Botanical Magazine from 1805 to 1920, or the Botanical Gazette , or hundreds of volumes of botanical journals. For history buffs, botanists, and artists, there are the complete volumes of the U.S. government’s western survey reports, complete with wonderful illustrations and fascinating accounts of the expeditions--all free with no constraints, other than a prohibition on commercial use of the information. THE BIODIVERSITY HERITAGE LIBRARY (BHL). This very large project has been made possible by a consortium of natural history, research, and botanical libraries that built on the success of Botanicus to offer free access to a wealth of natural history knowledge. 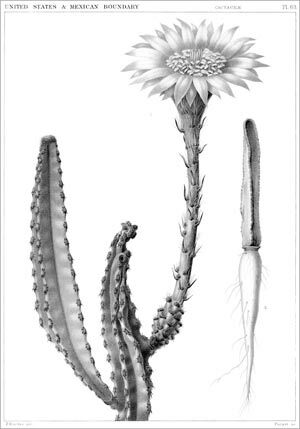 BHL’s digital library links to the Botanicus database, but its catalog is significantly larger and is not limited to botany. Entire volumes can be downloaded for free for personal use, but commercial use requires special licensing. BHL’s home page links to their Flickr stream, which is nice if you just want to browse their splendid collection of natural history art. Books are not the only subjects for digitizing. Field diaries from worldwide expeditions can be found in the library, and currently the Smithsonian’s very large collection of natural history field books is being digitized. To keep up with their latest acquisitions, you can follow BHL's excellent blog. Both of these sites have collaborated in the presentation of ENGELMANN ONLINE. This ongoing project of the MBG is categorizing and digitizing their collection of George Engelmann’s writings, correspondence, and personal herbarium. Currently, some 12,000 plant specimens, many collected during the western survey expeditions, have been digitized and are available at MBG’s Tropicos. In 2013, MBG digitized more than 5,000 letters from Engelmann’s professional correspondents, from survey expedition personnel (Major Wm. Emory, Arthur Schott, Asa Gray, John Torrey, and the many specimen collectors) and such notable colleagues as N.L. Britton, John Gill Lemmon, and John Muir. Unfortunately, the collection does not include outgoing letters from Engelmann. Also included in his papers are sketches made by Paulus Roetter to prepare the drawings for Engelmann’s reports for the U.S.–Mexican Boundary Survey and the 35th Parallel Pacific Railroad Survey. One of these sketches is shown here alongside the completed engraving. This appeared in the September 2015 issue of The Desert Breeze, the monthly newsletter of the Tucson Cactus and Succulent Society.